(Newser) – Facing a growing investigation that accuses him of sexual misconduct and using racist language at work, Carolina Panthers owner Jerry Richardson announced Sunday that he will sell the NFL team after this season. The team on Twitter linked to a five-paragraph letter by the owner. "I believe it is time to turn the franchise over to new ownership," Richardson wrote, saying he wouldn't begin discussions until after the season. The Panthers, who lost in the Super Bowl two seasons ago, are in playoff position again. "I hope everyone in the organization, both on and off the field, will be firmly focused on one mission: to play and win the Super Bowl," said Richardson, 81. The NFL awarded Richardson, a former player with the Baltimore Colts, an expansion franchise in 1993, and he has been the team's only owner. 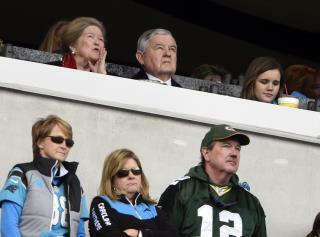 Richardson attended Sunday's win over the Green Bay Packers and was photographed sitting beside his wife Rosalind in his luxury box. Richardson's announcement comes after a Sports Illustrated report Sunday that cited unnamed sources who said Richardson made sexually suggestive comments to women and on at least one occasion directed a racial slur at an African-American Panthers scout. The sources said at least four settlements with former Panthers employees came with non-disclosure requirements forbidding the parties from discussing the details. Forced to take million$ and million$$ for his team at the tender age of 81? How can that not be cruel and unusual? And where do I sign up? Jesus was quoted in the Bible " every body needs to love the blackies or they will be excommunicated." He doesn't have that much money.